Tressette - thanoscardgamess jimdo page! Tressette (or Tresette) is an Italian partnership trick-taking game for four players, with partners sitting opposite. 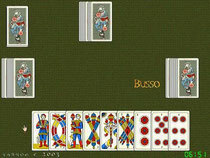 It is among the most popular point-trick games in Italy and it is played also in Croatia. This is a full featured implementation of the game. It includes the declarations for the hand combinations (such as Napoletana, four or three of a value etc.) and the signalling between partners, such as the "Busso" command or the "Volo" one. For the game, a 40 card pack is used with the Italian suits: swords, batons, cups and coins. In each suit the cards rank as follows: 3 (highest), 2, A, Re, Cavall, Fante, 7, 6, 5, 4 (lowest). Here you can play it with four real-world scanned Italian card decks: the Siciliane, the Piacentine, the Trentine and the Triestine cards.